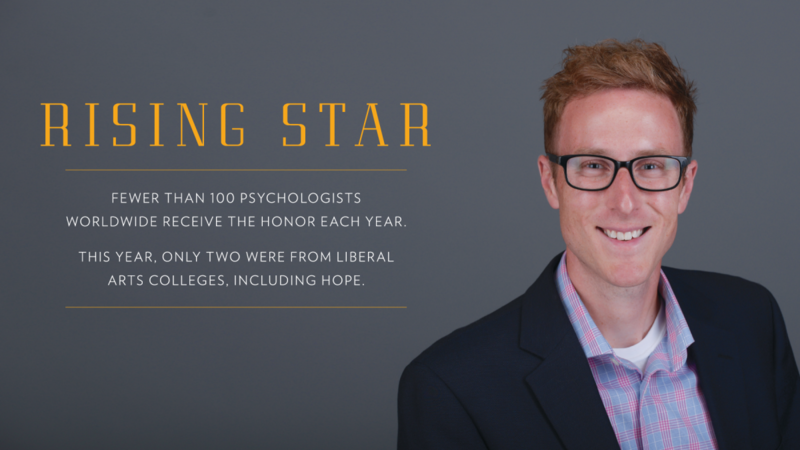 Dr. Daryl Van Tongeren of the psychology faculty has been named a Rising Star in research by the Association for Psychological Science, a recognition most often bestowed on scholars at institutions with graduate-level programs. The Rising Star designation recognizes outstanding scientists in the earliest stages of their research career post-Ph.D. whose innovative work has already advanced the field and signals great potential for their continued contributions. This year’s list includes just 95 researchers from across the United States and around the world. That Van Tongeren, who joined the faculty in 2012, is among those honored this year doesn’t surprise Dr. Scott Vander Stoep ’87, who is dean for the social sciences and a professor of psychology at Hope. Van Tongeren’s research focuses on the social motivation for meaning and its relation to virtues and morality. Specifically, he and his students adopt a social-cognitive approach to study meaning in life, religion and virtues, such as forgiveness and humility. For example, one of his current studies, part of a multi-institutional project, is seeking to understand how natural disasters shape what survivors believe, while another recently focused on the role that the desire for meaning plays in the tension between scientific and religious belief. An assistant professor of psychology, Van Tongeren has published more than 100 journal articles and academic book chapters. He has received multiple grants for his research from the John Templeton Foundation as well as from the college. In addition, Hope named him a Towsley Research Scholar in 2015 and he received the college’s Social Sciences Young Investigators Award in 2014. He regularly involves students as collaborative researchers in his work, both part-time during the school year and full-time during the summer. Several Hope students are co-authors on his publications, and students he mentored in research have received a regional award for excellence from the Midwestern Chapter of Psi Chi — The International Honor Society in Psychology two years in a row.